Andrea von Bujdoss (AKA "Queen Andrea") is a NYC-based fine artist, muralist, graffiti artist, typographer and graphic designer. A die-hard native New Yorker raised in downtown Manhattan, Andrea has been deeply inspired by the urban landscape from an early age. Her style is consistently marked by a bold use of color, design and advanced typography. As a young teen part of a newer generation of early 1990's graffiti writers, she befriended some of the most prolific old school subway graffiti writers and diligently taught herself the complicated artform of graffiti by consistently practicing her letters and eventually developing her own unique style. She earned a BFA in Graphic Design and began a successful career, working for worldwide brands who appreciate her versatile and passionate knowledge of typography, branding and visual communication. Her work has directly impacted graffiti, streetwear and urban culture. 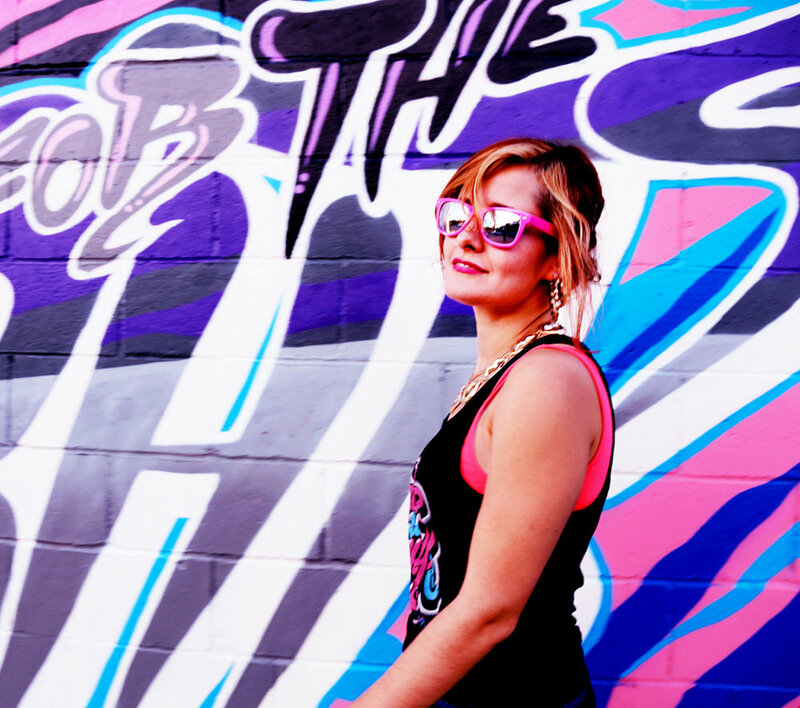 Andrea has spent nearly 20 years perfecting her graffiti and typography skillset and she is now one of the most notable female graffiti artists in the world. The excitement, color, diversity and crazy energy of city life, and especially graffiti, is where Andrea finds her creative inspiration. Renegade cutting-edge artforms, brash sub-cultures and lifestyles that have sprang forth from an ever-changing urban metropolis give her the visual stimulus, the guts, and the urge to create and innovate. Her artistic style is influenced by an endless appreciation of typography, as well as themes of urban life, hip hop lyrics, the advertising age, pop culture, geometry, symbolism, signpainter lettering and super bright color palettes. Andrea's newest paintings are intricate and intense explorations of geometry, color and form which create fantastical, bright worlds of abstraction. Back in the streets, Andrea has developed a reputation for her oversized typography murals. She has been featured in major art shows, solo shows, magazines, books, fashion lines, brand collaborations and has curated and exhibited in numerous art shows around the world.